My girlfriend’s lovely mother is an admin at a pre-school. One of the recent projects for the kids was a short relaxation/meditation time, and then discussion about where or what their eager young minds took them or came up with. All of the topics were funny and creative but one stood out to me. When asked about the images and thoughts she had, hers was to, “go inside the Earth Machine.” The Earth Machine. Immediately my interest peaked and my mind searched for answers and ideas. I had images of my own pop into my head so I drew a picture of it and sent it to the kids at the school. I thought of it as a machine that works for the Earth to help clean it up. 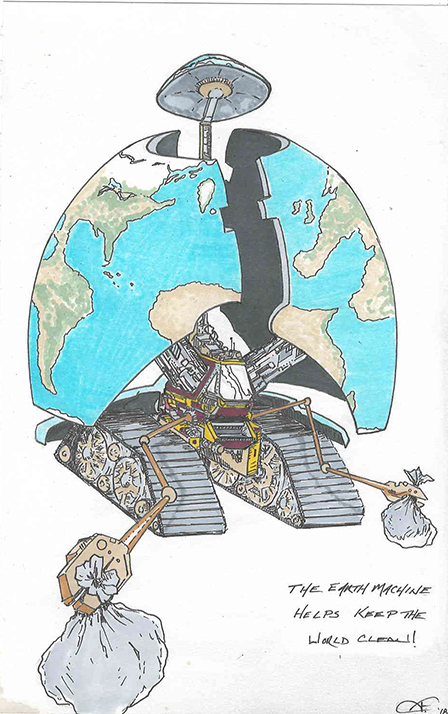 “The Earth Machine Helps Keep the World Clean”, as the newly branded slogan goes. Since this happened right around Earth Day, I felt the timing was perfect.